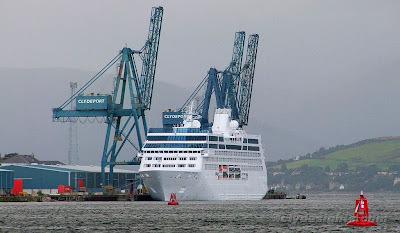 Also visiting Greenock on Saturday was the smaller cruiseship TAHITIAN PRINCESS, which had arrived before MAASDAM but was not due to sail until the early hours of Sunday morning. She had come from Dover via Dublin, and was also making her way across the atlantic, in her case to New York, with a number of ports of call en route. TAHITIAN PRINCESS is one of a number of identical sisterships that were built for the now defunct Renaissance Cruises - her original name was the somewhat unimaginative R FOUR. She came from the French L'Atlantique shipyard at St Nazaire in 1999, is 181.0 metres overall and 30,277 gross tons. Following the failure of her original owners in 2001, she was leased to Princess Cruises the following year, and later purchased outright by the company. Following deployment in the southern Pacific Ocean, TAHITIAN PRINCESS has spent most of this year cruising worldwide, and to reflect this new role, she is due to be renamed OCEAN PRINCESS later this year before embarking on a series of Asian voyages. This was the second occasion this year that two cruiseships were berthed at Ocean Terminal simultaneously.